The chickens have been loose by day for a couple weeks in a small, temporarily-fenced run in one of pens just off the barn. Today, the cows were let in to the pen to graze down the long grass. 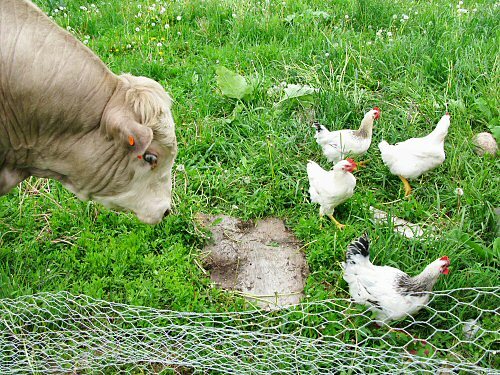 The rough plan was to let the chickens free-range around the whole area, which is about half an acre, and the cows would act as bodyguards, keeping out…predators. 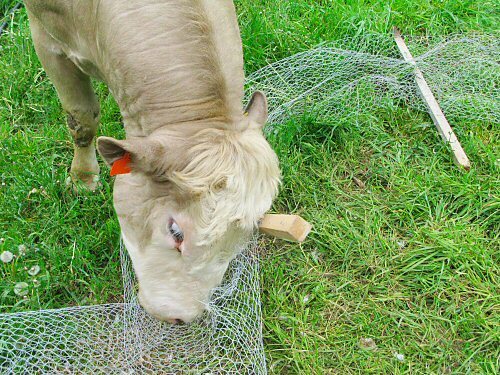 Dunno, sounds like good plan, livestock’s all pretty new to me… Consensus was the cows would not respect the chickenwire, so I went to take it down, just as Monty the Young Bull discovered it. I couldn’t help watch, kinda fascinated by the slow motion, low key destruction, as he methodically butted down the posts…scratching. …and now, the chickens, at least, the Frey’s Dual Purpose and the couple of White Rocks that follow them outside…are free as they wanna be! Wow. I’ve been away for too long. Had no idea your brood of farm animals had expanded so greatly! In the last picture, it does seem like Monty is following those crazy chickens. your place looks like things are shaping up nicely……i wish we had such good germination with the carrots. nice looking bull…what breed is he? 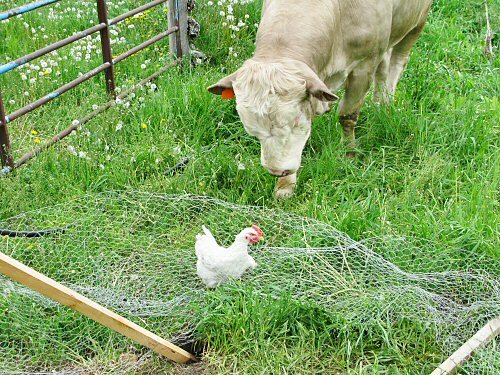 next year, three backyard chickens… I’ve promised myself. Your farm looks great. I love the pictures you have. Looks like a nice season. I came across a site URL: Riferam.com. They manufacture PASTURE PUMPS. They dont need any electricity, they are very environment friendly. The operation of these pumps are fairly simple to understand. I would encourage you to check out the details….ciao! !